VATICAN CITY—In an extraordinary moment like this one, the temptation is to focus just on the honor. Sometimes, it’s especially tempting for the person receiving the honor. Within minutes—at 11 a.m. Rome time on Nov. 19—Cardinal-designate Joseph W. Tobin will stand near the central altar at St. Peter’s Basilica at the Vatican. There, in a ceremony called a consistory, he will soon be installed by Pope Francis as one of 17 new cardinals in the Church. At 64, he will become the youngest of the 18 American-born cardinals. He will also become one of the 120 cardinals from around the world who are eligible to vote, when the time comes in the future, to elect a new pope—or even become a new pope. His easy, sincere connection with people shines through in the moments before the beginning of the prayer service in which he will be installed as a cardinal. He heads into a section filled with family and friends, hugging them, reaching out to them, smiling with them. When he walks to another section of the basilica, he flashes a smile of surprise when he recognizes a man he met long ago during the 20 years he served the Church in Rome. They embrace and laugh together, remembering the time that Cardinal-designate Tobin‘s car had a minor fender-bender with the other man’s car—Cardinal-designate Tobin smiling again as he admitted the accident was his fault, just as he did then. During this time, he also asks a friend to take a photo of him and the other two Americans who will become cardinals today—Cardinal-designates Blase J. Cupich of Chicago and Kevin J. Farrell, prefect of the new Vatican office for laity, family and life. And he searches for his 93-year-old mother, Marie Tobin, putting his arms around her when he finds her. And she beams for the oldest of her 13 children. It’s also telling that 11 of his 12 siblings are here, the exception being a brother who has to undergo surgery and couldn’t make the trip. And numerous other family members—the Tobin clan—have made the journey. So has Duncan MacDonald, a friend since their grade-school days in Detroit. And there are about 20 priests from the Redemptorist order, the order for which he served as superior general from 1997 to 2009. Then there is the strong contingent from the Church in central and southern Indiana—priests he has ordained, priests he has served with, priests he has come to view as brothers. The archdiocesan contingent also includes colleagues that he regards as friends, and members of the faithful that he has always viewed as extended family. Surrounded by all parts of his extended family, he looks relaxed, joyful, at peace. Greg Otolski takes in the entire scene. The director of communications for the archdiocese knows there’s also another important quality of Cardinal-designate Tobin’s approach to people: his compassion. It’s a compassion that Otolski believes has been shaped from Cardinal-designate Tobin’s background: he comes from a large family, his father died at a young age, his mother had to raise their children by herself, and he has served as a pastor “in some really poor areas” in Detroit and Chicago. At 11 a.m., Pope Francis and the 17 new cardinals approach the central altar at St. Peter’s Basilica. As Cardinal-designate Tobin sits by the altar waiting his turn to be installed by Pope Francis, less than 3 1/2 years have passed since the two men shared another special moment in this same basilica. On June 29, 2012, Cardinal-designate Tobin knelt in front of Pope Francis to receive his pallium—a circular band made from lamb’s wool that symbolized his role as the shepherd of the Archdiocese of Indianapolis and his communion with the pope. In becoming a cardinal, the connection between him and Pope Francis reaches an even deeper level for the two men who first became friends when they met during a meeting of the Synod of Bishops in Rome in 2005. That deeper bond is reflected in the cardinal’s red cassock that Cardinal-designate Tobin already wears on this morning—the color representing a cardinal’s desire to stay faithful to Christ and the Church, even to the extent of shedding his blood for them. It’s the kind of bond—being there for another person completely, putting the other person first—that has marked Cardinal-designate Tobin’s life. It’s also the kind of bond that Pope Francis talks about in his homily during the prayer service, moments before installing the 17 new cardinals. Pope Francis refers to the Gospel of St. Luke’s “Sermon on the Plain,” a call that Christ gave the Apostles. Pope Francis says it’s a call that all Christians must embrace, offering mercy and hope to everyone, even our enemies. At the end of his homily, he tells the newest cardinals waiting to be installed that they must lead this effort. That call resounds in Cardinal-designate Tobin’s mind as he walks up the steps of the central altar of St. Peter’s to be greeted by Pope Francis—to be installed as a cardinal. In that moment, people throughout St. Peter’s strain for a closer look at their son, brother, friend and family member. As he kneels before the pope, the pontiff embraces him in a long hug. Pope Francis then places the red biretta on now-Cardinal Tobin’s head, an exchange that the cardinal’s mother gets to see up-close from her seat to the right of the altar. Walking down the steps of the altar, Cardinal Tobin moves toward the area where the other members of the College of Cardinals are waiting for him. One by one, he smiles and embraces them, receiving their smiles and embraces in return. 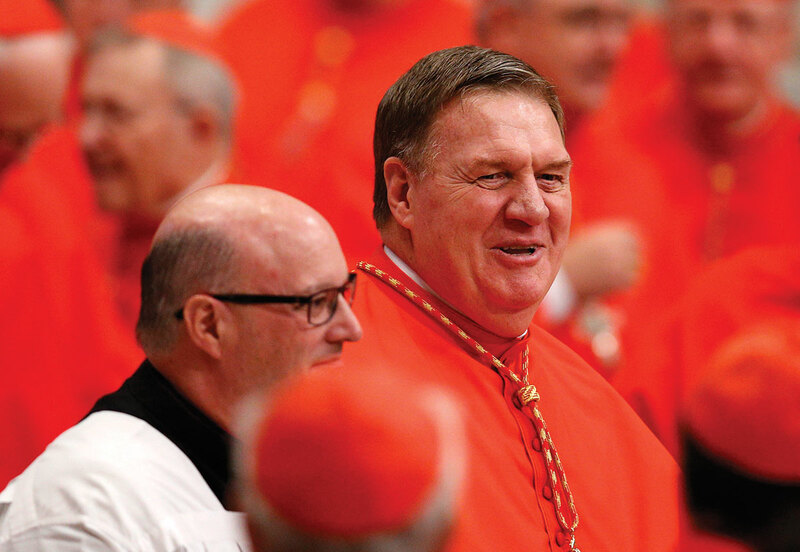 As the prayers, wishes, smiles and tears flow toward and for newly-installed Cardinal Tobin, there’s also the memory of the telling words he shared in a conversation on the evening before he became a cardinal. It was a conversation in which he talked about the importance of having his “extended family” here in Rome—all the people who have shared the journey of his life, all the people he has come to know and love, all the people who know and love him. Among that “extended family” he especially remembered the people of the Archdiocese of Indianapolis—those who came to Rome and those who are back home. “Election night helped me understand,” he said about this gift of extended family. “I saw Indiana governor-elect Eric Holcomb’s acceptance speech. What really struck me was he said, ‘All through the campaign, people said Holcomb can’t do this, and Holcomb can’t do that.’ He said, ‘They’re right, but we can.’ And that’s what this experience is, too. He also talked about how the biggest struggle of the past six weeks has been his reassignment to the Archdiocese of Newark—and how he plans to confront that struggle. Drew and Wilma Young of St. Mary Parish in Greensburg are part of that “extended family” from the Archdiocese of Indianapolis that has come to Rome to celebrate the man that has been their spiritual leader for the past four years. They remember how he shared in the grief and sorrow of their community when four local people were killed in a small plane crash shortly after he was installed as archbishop. They also recall the joy he shared when the parish dedicated its new church last August. On an extraordinary day, an extraordinary man became a cardinal.